Real Time Follow Focus: Integrated with an unprecedented follow focus wheel on the body, Crane 2 allows ±0.02° precision real time focus control through camera cable connection, so that you can always keep your subject in focus while moving, setting free your camera for more dedicated task. 3.2KG Max. Payload: Empowered by the 6th Gen. Instune Algorithm System which realizes 50% increase in motor torque and 20% improvement in noise reduction, the Crane 2 sets up a new benchmark for the industry supporting a max. payload of 3.2kg, mountable by all models of DSLR and mirrorless camera on the market. Instant Precise Attitude Compensation: Integrated with the pioneering 32-bit x 3 high-speed MCU parallel control technology which realizes 100% improvement in respond speed, CRANE 2 gets high above the industry standard with its cutting-edge attitude compensation system and unparalleled anti-shaking stabilizing performance. Intuitive OLED Display: The intuitive interface design help you easily identify the connection status, battery level, control mode and multiple camera params, giving you full control over every detail. 18-Hour Runtime for Longtime Task: Three high energy efficiency 18650 rechargeable batteries give the Crane 2 maximum runtime of 18 hours with 6000mAh capacity. Meanwhile, the Crane 2 allows convenient real-time charging to the camera even when your camera is without batteries. Innovative Quick Control Dial Design: The quick control dial on the control panel is like an integrated extension of your camera. You can either press or rotate the dial to make various camera parameter settings such as TV, AV, ISO and EV, giving you seamless camera control independently from any software applications. Complete Kits with Elaborate Details: Crane 2 comes standard with a comprehensive accessories kit, including camera control cables to connect with various brand cameras, an Aluminum alloy tripod, an EVA carrying bag, as well as a standard quick release plate that allows quick camera installation to the stabilizer or tripod within seconds, ideal for videographers stepping up their game. 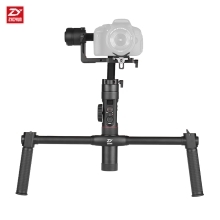 Crane-EH002 Dual-hand Crane Extended Handle for Crane 2 Gimbal: Can be equipped with Zhiyun Crane 2 gimbal, multi-choices of holding ways (including positive grip gesture and inverted grip gesture) provide various shooting ways. Can realize shooting in different angles, and finish the shooting in most of circumstances.